For all the words that I’ve collected over the years, no cache of diction can offer a truer insight into the nature of this place other than it is very real. Here, even the banalities that come standard in any quotidian seem to carry profound connotations beyond their immediate significance. In truth, I’ve found that merely standing on Israeli soil seems to in and of itself offer some weighty statement. This place is laden with so much hope and redemption, and yet there seems to be a soldier shouldering an uzi for every square foot of land. For a peace-philic person, the acceptance of a very visible and necessary military presence can be jarring at first. Though like all things, it becomes familiar after a while — even comforting. In my time in Israel I’ve come to understand that though in the US we talk about fighting for freedom all the time, very few of us have the vaguest idea of what that actually means — of what that actually looks like. Without doubt, it takes only a few “normal” days here to realize that there’s some ineffable aspect to this land that is very charged — and so addictingly worthwhile. Even for all of the propaganda, dissent, and conflicting opinions regarding what Israel is –Israel the political entity, the state, the complicated democracy, the military power — the ideals for which Israel stands are truly extraordinary. That is undeniable. It’s the embodiment of a living dream, and that has a tremendous amount of beauty. This doesn’t always make the dichotomy of state and ideal any easier to stomach, though it helps. Ideas and actions: they’re not always the most compatible. Even for all of the ideological snafus, it’s important to remember that complicated places often lend themselves to simple joys, and that is something that I’ve really loved here. Of course, there’s the unadulterated bliss in eating a fresh fig from Eretz Yisrael, dancing carelessly in a Ben Gurion terminal with a new oleh (immigrant), or wandering through tangled streets to find a shul simply because the singing is rumored to be wonderful. Nevertheless, I am one for the profound, so where I most revel is in the lightness and terror of all of this newness, the finding of friendship with individuals in jarringly transitional phases, the marvelous misgivings of independent travel, and the curious act of pressing one’s forehead against the Kotel and feeling an unambiguous sense of vastness. That was a special moment during my birthright trip this past June. Even though I extended a couple weeks I still had not spent enough time in Israel to peruse this newfound appreciation for my peoples homeland. After graduating from the University of Colorado I decided to continue my time in Israel with a MASA organization called Career Israel. Spending 5 months in Israel while gaining valuable experience through an internship seemed to be the perfect buffer before my entry into “the real world”. Now, over two months into the program, the stars are starting to align. Travelling the country, learning new things, meeting new people, living and working in Tel Aviv has been such a remarkable experience. I spent Rosh Hashanah with an Orthodox family in Jerusalem and I walked the vacant streets of Tel Aviv during Yom Kippur. My boss, Itzik Yarkoni, has also taken me under his wing and given me a great amount of responsibility and training. I have the opportunity to positively re-brand Israel using social media, with a strategy that is focused on sharing personal stories and experiences from people who have been to Israel. When people go on programs like birthright they get really fired up about Israel and love their time here, but soon enough every day life returns and the motivation to help the homeland is lessened. People can continue to help by changing the way others think about Israel by sharing their story with BOMAH. I still have three months left here on my program here in Israel, so during that time I am going to be blogging about my experience working for BOMAH at different café’s around Tel Aviv and Jerusalem. Even though you feel completely at home and speak the language, you still sound like a foreigner. What you thought was impeccable, fashionable taste in shoes was completely wrong. Shoresh and Naot are… trendy? Believe it. There is no such thing as “waiting your turn in line.” It just doesn’t exist here. Saying things like “I don’t do public transit” doesn’t fly anymore. Now you do. When someone smashes into you full force without even paying attention to what happened, it was your fault. Accept it and move on. You need to learn not to accept the first, second, third, or fourth price offered to you. Your right-wing views are still met with gasps and raised eyebrows. Yes, even here. You’ll likely re-examine your life daily once you see people your age fighting for our homeland. It’s time you completely abandoned “sorry” and “excuse me,” possibly for a few choice curse words in Arabic. This will get your further. There are things more important than pleasantries. These are sincerity and openness. Someone will be willing to go completely out of his way to not only give you directions, but lead you there personally. People are more genuine and honest than you’ve ever experienced, and it’s SO refreshing. You see the way people care about their fellow Jew and it warms your heart. You’ll visit the Kotel and understand what really matters in your life. You’ll understand what real love is when you see yourself loving this place more than yourself. You won’t want to go home, you’re already here. A few hours later we landed in Israel. After 20 long years I had returned to the place of my birth. Now don’t get me wrong, I had visited and traveled around Israel since moving at the age of 6, but it had always been with family. Going with Taglit, specifically Mayanot, was more than just an adventure. It was life changing. When I look at my current life I know that I would never be the person I am without my trip to Israel. I know it is cliché to say this but… Birthright changed my life. I went on Birthright a secular Israeli Jew, but after seeing students from all different backgrounds and upbringings united in the love of our shared heritage, religion, and most especially Israel, I left with a deep desire to explore my Judaism, and I longed for a connection with my Jewish heritage. Our group was lucky enough to have the chance to celebrate two Shabbats, one in Tiberius and one at the Kotel, as well as the first half of Chanukah on the trip. I will never forget that first night of Chanukah, crushing into a cramped street in Old Jaffa lighting candles at some long unused synagogue. Singing the blessings over the candles and Shehecheyanu as strangers began joining us in a chorus of singing so loud I was certain the whole country could hear. The camera shook in my hand as I desperately tried to capture the experience, the singing, yelling, and laughing of my fellow Birthrighters. But the camera could do little to capture my emotions, the pride I felt for my religion, and for the amazingly strong Children of Israel who have fought tooth and nail to defend the Jewish State was astounding. Since returning from Israel I have longed for the same spiritual high I felt in Jaffa. I joined Jewish groups, religious, secular, Israel advocacy, even the Jewish sorority. Israel sent me down a path to discover who I was and a deep desire to connect with the Holy Land once more. Israel lit a fire within my soul, a desire to keep the Jewish State alive in my every day and a deep yearning to return. Persons who speak and understand one language care not for creativity or passion; they are strict in composure and crisp in their manner of speaking. Language is idealism, and speaking is the romance of the tongue. Thus, I make it my upmost priority to fall for the bilinguals. Trilinguals are exemplary, obviously, but constantly reaching for the stars gets tiring. So bilinguals will do. And how many of them there are in Israel! Hebrew is a given here, clearly, so that’s the basis from which I’m working. Almost everyone speaks English, or at least Hebrish. Hebrish counts as .5 of a language, so if there’s some Arabic in there or maybe a little telenovela inspired Spanish, you’ve got yourself a full-fledged bilingual. Think about it, how many times can you hear “I love you” in the original language of the Bible before you get sick of it? If your tolerance is low, say the word and it switches to Russian. Listen, I’m no love doctor, but I know what I’m talking about. I’m sure that falling in love in North America has it’s perks. America’s got its share of immigrants and bilingual speakers, sure, and I heard in Canada they speak French. But falling in love in Israel is magic. It’s just one of those things you’ve got to do to understand. Wherever you are, I dare you to go out today and hit on someone who speaks a different language than you. Preferably something ancient, like Hebrew or Greek. Because loving someone with knowledge of an ancient language keeps that language alive, and we’re all linguists at heart. Maya Fried is a current Hasbara Fellow and active member of MishelanuLA, she is also an Onward Israel participant. The first time I stepped foot in the Land of Israel, I was five years old. I couldn’t comprehend where I was, but I knew I was in a place where my ancestors had walked, a place where I could comfortably live as a Jew, a place where I am welcomed by complete strangers, but more importantly a place I would soon realize was my home. Ever since that first trip to Israel, I had a strong love for the people and the land but I couldn’t understand why. I kept going back and soon understood it. I was no different than many of the people around me, I could embrace the culture and the sense of belonging as soon as I got off my sixth flight to Israel, just as I had felt it my first few times. When deciding what to do with my summer, I decided to spend the first four weeks of my summer in Israel, spending the first two weeks learning how to become an advocate on campus, and the last two embracing the land I love so much. I learned how to stand up for my land, was able to embrace the culture of the State, and continue to call it my home. It’s not only my home, but the Jewish people’s home. It is the place where our ancestors walked, it is the place where our history became history, and a home for Jews everywhere. No matter where I am in the world, I am always thinking about my home, the Land of Israel. I was born a month early in California in 1992. Born a whole month before my time, and still my mother had to have a caesarian in order to convince me I should come out. That was the first and last time my mother experienced the glory and pain that is childbirth–I am an only child. When my father tells the story of that day, he likes to embellish the part about my mother ripping his shirt and almost breaking his hand before she got her epidural. Most of my “family history” details are similar to these, that is, they usually start with me. Of course, I’ve always known that my father was born somewhere near Tel Aviv, that he went to yeshiva from a young age, that he has two degrees from Bar-Ilan. I’ve always known that my mother was born in Ashkelon, the seventh of seven children, that her father owned a movie theater, that everyone recognized their last name. My father was an officer in the army. My mother was considered the beauty queen of her small town. I grew up with all these pebbles of information, but I could never make a mountain out of them. I could barely make a hill. But I tried anyway, knowing that Israel was the foundation, untouchable. After all those years in America, my parents neglected to take me to their motherland. My first trip to Israel was nine months long. I was just shy of eighteen. My mother told me not to go; my father took me. While my friends were unpacking in their dorm rooms in California, my father pointed out his old apartment to me in Tel Aviv. While my mother went to bed in Thousand Oaks, her sister showed me pictures of her family– my family–that I had never seen. My cousin drove me by a site of ancient ruins I had just seen my mother laughing on in an old photo. I sat with soldiers wearing uniforms my parents donned thirty years prior. I ate the food that they too had eaten, I hiked the same trails, and I spoke their language. A lot of people seem to find themselves in this country. People are moved to tears at the Kotel. They are astounded by the many climates and terrains they find themselves hiking through, they are inspired by the teenagers in uniform, and many even enlist themselves. Personally, I didn’t think I needed to be “found.” I was over the Kotel in about fifteen minutes. I wasn’t bombarded with overwhelming urgency to enlist. I didn’t find myself in Israel–I found my history. I found the lost chapters of my parents’ lives. I found out where I came from, and where I could have been all this time, and who I could have been, had things gone just a little differently. Moreover, I found my future. I am now involved in explaining to others what Israel truly means for this world, an explanation I didn’t truly receive until just over three years ago. With every passing moment, I am making up for time lost. I could have been in Israel every summer since my birth, like many other Jews. Instead, I am writing from Haifa on my third trip to Israel. They say third’s the charm, but charm I experienced a while back. Now I’m just getting settled, eating absolutely everything, and taking it all in. I made it back home. UC Irvine has been in the headlines many times over the past few years related to anti-Israel activities such as the infamous walkout on Israeli Ambassador Michael Oren, but not often have the headlines been about issues that demonstrate a positive attitude toward Israel or the Jewish student body. It is a welcome change to see a more balanced environment developing as a result of the anti-Israel hate events that have been held on campus. “The situation on campus is both negative and positive” said Jonah Balakhaneh, President of the group Students for Peace in the Middle East. He continued, “It has had a magical effect on many Jewish students who have now gotten very active on campus and focused their efforts on learning as much as possible about Israel.” This is a quite different story from impressions of UC Irvine as a hotbed of anti-Semitism where Jewish students are made to feel uncomfortable year-round. In fact, based on what I have been hearing, things are changing rapidly for the enthusiastic Jewish community. The second choice is the one that Yarkoni chose as he became very active in the Sderot Media Center. “Instead of running away from the rockets, we chose to stay so we could document the attacks and present the situation that we are facing to the general public with social media.” This formula, which has been successfully used in Sderot for several years, has now been implemented at UC Irvine, where students are actively working together on a social media team. Through monitoring what is happening around the campus and providing accounts of events, straight from the students, the UC Irvine Social Media team has already paid off. Students have described seeing increased attendance at their events and also have gained a lot personally by learning more about themselves as Jews and becoming supporters of Israel. The social media team at UC Irvine has responsibility for blogging, photography, and creating videos to document what is happening on the campus. According to Cathy Shutaya, a member of the social media team who manages the group’s blog, “It is important to show that there is a vibrant Jewish community at UCI and that it is not a terrible, anti-Semitic place, as people often describe it.” Shutaya continued, “Beside for one time of the year, during which ‘hate week’ takes place, I cannot feel the tension on campus and that is important to note.” This was a feeling echoed by all students that I spoke with who are active in Jewish life and Israel advocacy. Similar statements were made by Ari Friedman, a freshman in charge of photography for the social media team. Friedman said, “UC Irvine is a great place for Jewish students interested in discovering themselves and their Jewish identity.” He went on to say, “By being faced with situations throughout the year, it gives students a chance to stand up and represent themselves, as well as a cause that is greater than them.” Along with the day-to-day encounters on campus, students have also been privileged to learn about Israel from Yarkoni and to attend different events and conferences that educate on different aspects of Israel. Unfortunately, not everything on the UC Irvine campus is totally positive. The MSU just finished up their “Palestinian Awareness Week,” entitled “Palestine: an Invisible Nation.” “Hate weeks” in the past, have provided an opportunity for the MSU to hang inflammatory items around campus, such as bloody Israeli flags, and to bring in speakers, such as Amir Abdel Malik Ali, who during last year’s “hate week” publicly stated his support for terror groups Hezbollah and Hamas, and called Jews “the New Nazis”. 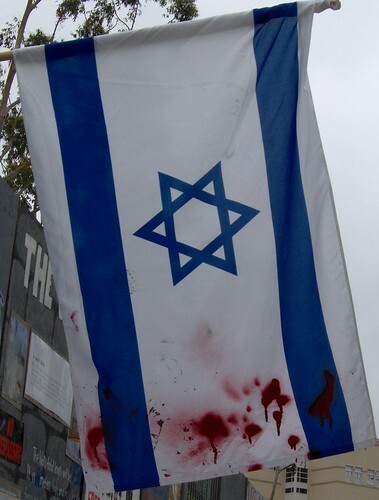 Jewish students felt a bit of relief this year since MSU did not re-invite Ali for an annual return or hang bloodied flags around campus, but still, the week was problematic for several reasons. 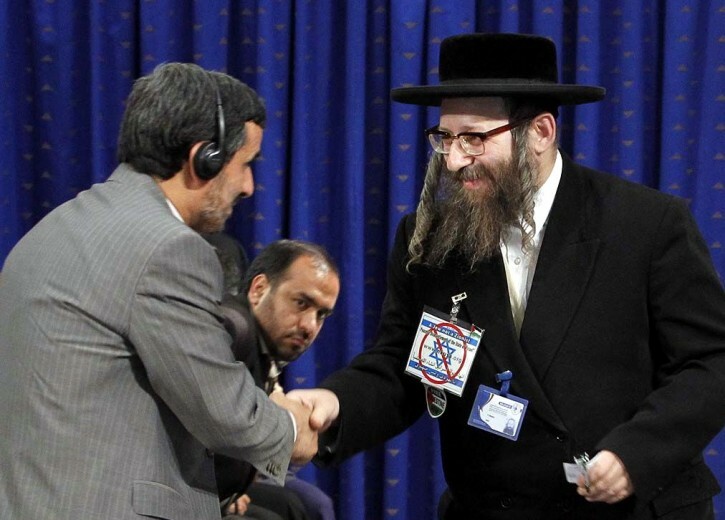 “This year they used more Israeli and Jewish speakers than in the past,” said Yarkoni, “but what they’re not telling the public is that these Jewish and Israeli speakers represent an incredibly small minority.” Additionally, they did not tell students that speakers, such as Weiss embraced President Mahmoud Ahmadinejad of Iran or that Bazian once provoked a crowd at UC Berkeley saying, “How come we don’t have an intifada in this country?” In addition, materials found on campus did not recognize Israel’s legal existence as a state. On the “wall” set up on campus meant to depict Israel’s security barrier, a map was posted for the public to view that did not recognize Israel. Instead, Israel’s creation in 1948 was referred to as an “occupation,” which shows exactly where the MSU stands on the conflict. With all of the efforts that have been made to demonize Israel, it is encouraging to see the Jewish students at UC Irvine standing up for Israel and being proud of their heritage. With the ongoing social media initiative and other activities taking place, it looks hopeful that the Jewish groups on campus will continue to flourish. As many of the students said, UC Irvine can be a wonderful place for Jewish students to study, as well as learn more about themselves and what it means to be a Jew. It certainly appears that the students will no longer tolerate the hate speech on campus or branding of their university as “anti-Semitic” – instead they hope to grow their movement to ensure a positive experience for all students. A bent-over elderly man, almost transported to this spot and time from perhaps the 1930s limps by me. “?פוטו ממקום” (“tourist photos”) he faintly pipes, wearily lifting the obsolete Polaroid. If only it weren’t for the inappropriate over-commercialized setting and the iPhone, he would be in big business here… The polaroids will fade and the film will die, but there is something so unforgettable about this man’s characteristic limp, his urgency in capturing ephemeral moments using the most classic, timeless methods. He is ready and willing to work, to reinject the personal into human contact. And thus it’s so simple, like so many things about the character of this country (even though most of the world fails to notice, and only focuses on the complicated). There is a faith in what worked in the past, dedication to sacred memory, and unwavering responsibility of commemoration. Jews visit a Temple-less Temple Mount because the image in the collective conscience cannot be obliterated, a nation crowds and commemorates for an entire day the death of its fallen heroes because of the sheer magnificence of the revived Jewish fighter. Throngs burst through the Jerusalem gates in May, because a memory of a besieged Jerusalem is both in the distance and yet in impossible proximity and the miracle of Jewish sovereignty is now so palpable. Just 70 years before, they had been proceeding in masses toward a different faith, and now the march is voluntary, empowered, marked by the stride of a nation reclaimed through strength and persistence. Songs of yearning, songs thousands of years old ring in the corridors of the Old City in tune to the clinks of the chisel that uncovers yet more of my Jewish history, and beckons with outstretched arms, “YOU—you belong here, and don’t forget it!” And these rocks are a transcendent sight, tear-jerking. It is a curious phenomenon, the survival of stones beneath the plunders of history. So too the sustenance of a nation fated to be eradicated and forgotten. But no, old people saunter in the Old City streets and children giggle and play in the squares, because they — and I — have returned to that most satisfying state of being—free—in one’s homeland. Yes, mister, I’ll take that photo. Stars of David surrounded the landscape of my 3rd floor apartment in Jerusalem, and my 18 year old self could not be prouder of the country my grandparents helped settle. But the moment I knew I was home was the first Friday morning in Jerusalem when the city has officially shut down from the week and began the transition to Shabbat. Shopkeepers selling off their last burekas, the smell of Challah in the air, and families cleaning their house for guests remind everyone in the country the day of rest is coming. As the crowd of people walking to and from Shul dies down, the streets become completely empty, barren, and exactly as they should be. I will always remember walking down the Light Rail in the center of Jerusalem on a midnight visit to the Kotel, knowing I am living my ancestors dreams, and keeping my heritage and tradition to the best of my ability, something I can only do in my homeland. We empower you to tell the story of your brand and share it with the world. The most important stories are yours! © 2016 BOMAH. All rights reserved.